Thanks to its exceptional location on the foothills of the Montagne Noire, located in the mythical triangle with the communes of Cabrespine and Trassanel Villeneuve-Minervois enjoys an excellent production of truffles. It is therefore quite natural that retail markets have been created for lovers of this noble mushroom and wholesale for professionals. The reputation of these markets is no longer to be proven since you can meet producers from every French truffle region, but also from Spanish and Italian producers. Friendliness is a must. 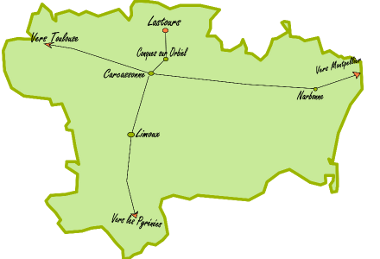 Villeneuve-Minervois is also the birthplace of the Confraternity Los Trufaïres de Vilanovà de Menerbes, which brings together truffle-makers, enthusiasts, and craftsmen of the Truffle. This brotherhood promotes this noble product by different manifestations: markets, charitable events, the Night of the Truffle, Gala dinner. It invokes only personalities who undertake to promote the Truffe de Villeneuve-Minervois at any time and to popularize it while maintaining its nobility. It was in 2011 that the Maison de la Truffe du Languedoc was created, a jewel entirely dedicated to the Black Diamond, in order to introduce all the curious to its secrets.